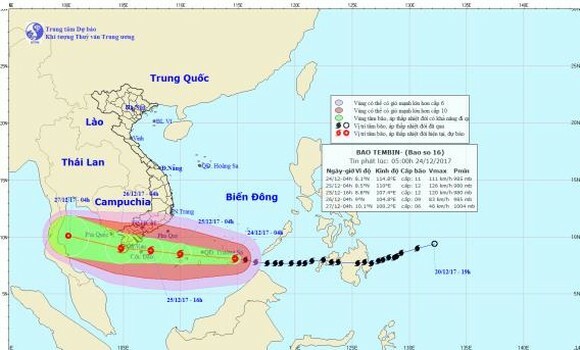 Typhoon Tembin entered the East Sea this morning, gained strength and headed towards the southern region of Vietnam where local authorities have prepared to evacuate over one million people out from dangerous areas, said the Central Steering Center on Natural Disaster Prevention this morning. At 7a.m. this morning, Tembin was located 300 kilometers east of the Truong Sa (Spratly) Islands. Strongest winds near the center of the typhoon reached level 12 moving 115-135 kilometers an hour, according to the National Hydro Meteorologcial Forecasting Center. In the next 24 hours, it is forecast to move 25 kilometers per hour to locate 300 kilometers east of Con Dao Island with fury remaining unchanged. The center of the typhoon will be in the waters off provinces from Ba Ria-Vung Tau to Ca Mau tomorrow evening with wind power reducing to level 11 moving 100-115 kilometers an hour. Under influence of the storm, the southern and central region will experience heavy rain within 2-3 days starting from December 25. Rain will spread to the northern region on December 26. Provinces in the Mekong Delta are rushing to harvest about 64,000 hectares of ripen rice fields which might be damaged when the storm makes landfall. At an urgent meeting in Hanoi yesterday, director of the National Hydro Meteorological Forecasting Center Hoang Duc Cuong said that the typhoon was likely to become the 16th one in the East Sea and would be very dangerous when making landfall in the southern region. There had been no the 16th storm in the East Sea in the history before. Tembin has not only appeared late but also been very dangerous with complicated path. Mr. Cuong said that a weak cold front has slammed into the northern region but it has not much impacted the storm. After travelling across Truong Sa (Spratly) Islands, Tembin is expected to degrade but the concern is that it will take only one day to move from the islands to the mainland. Therefore, the storm might not weaken in a timely manner with fury to remain unchanged at level 12 travelling 112-135 kilometers an hour and gusts of up to level 15. If that scenario comes true, Tembin will be stronger than Linda in 1997, the worst tropical storm in the southern region for at least 100 years which caused thousands of people dead and missing. Head of the Central Steering Board on Natural Disaster Prevention Nguyen Xuan Cuong said that Tembin would be very dangerous as the southern region is inexperienced in coping with large typhoons. Mr. Cuong required localities to stop all yearend meetings brace for the unseasonable storm and prevent heavy damage because the region’s terrain is even and flat with lot of islands and reinless houses. The Prime Minister has sent an urgent dispatch prompting provinces and cities and relevant agencies to postpone all unnecessary meetings and work together to cope with the storm. HCMC and provinces in the southern region such as Ba Ria-Vung Tau, Ca Mau, Ben Tre and Tien Giang have banned all boats from going out to sea, guided fishing boats at sea to shelters and prepared to evacuate residents out from dangerous areas. Tembin has been reported killed over 130, left about 64 missing and forced 50,000 people to evacuate in the Philippines on December 23.